Tucking some of my Valentine's and the photobooth strip from our Valentine movie night date into my project life. Wow, the movie The Impossible was intense, but so good. Time to put the felt heart supplies away. I'm working on this new Paper Parasol as a class example for French General to have at the shop. It's so fun to make these. I'll continue working on it and show you the finished demo here. We're going to keep the class size small so that we can open the parasols and work on them comfortably, so sign up soon if you want to join us! I'll be bringing this crazy quilt that I'm working on for Charlotte, using her fabric line for Blend, for those of you that have been asking to see it up close, students can check it out in person and get a little how to explanation. Well, that's what's going on for me today...off to play some more on my paper parasol! So far I've only sewed the felt hearts from last post in lines hanging up and down. I then taped them to the bottom of one of our blinds so that they look like those beaded curtains from the 70's. They make me so happy. Such simple materials, such a simple way of putting them together, but sooooo pretty. I couldn't stop trying to capture a good photo to share here. A lot of my felt is from Heather Bailey's shop found here. It's awesome quality and comes in so many pretty colors. I'm thinking these are going to go in my office/art room after Valentine's Day has come and gone. As for those that have asked for more pics of that...will do, whenever I get it done...it's still a mess! More Valentine's Day decor in the works here. I'm not sure where I'm going with this, surely a garland or two, but who knows what else. I love Valentine's Day decor, I love hearts, I love felt, I love colors.... such a happy place to spend some time. I can't wait to get back to it! Starting to feel some new valentine making coming on. Love love love valentines. Last night I asked my husband to get the Valentine's Day tub down from the garage. Couldn't help but take a few favorites out, like this shoebox my daughter made as the Valentine party activity when I was room mom for her class. I think it was preschool. It's got a slit in the top for valentines and every year I love to look through some of the favorites we have received over the years. 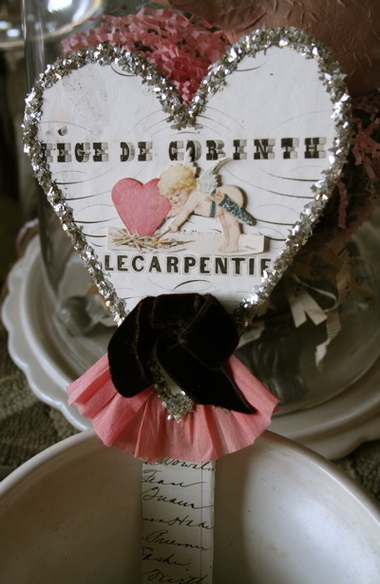 Vintage honeycomb has my heart, vintage honeycomb combined with Valentine's decor that includes hearts and arrows? Heaven. It's gonna be a fun week of creating and touring. We'll have more info next month. I started making a doily table runner. More info, including inspiration link and photos of mine tomorrow, after I finish it tonight. Hope you have a lovely evening. I plan on stitching by the fireplace after dinner and homework is done, that's my idea of a lovely evening! 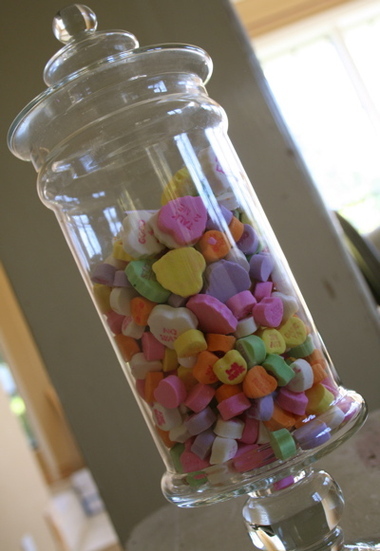 Here's a super quick and easy Valentine's Day decor craft, a great one for the kids. I bought these pre-cut paper hearts in the dollar bin at Target. 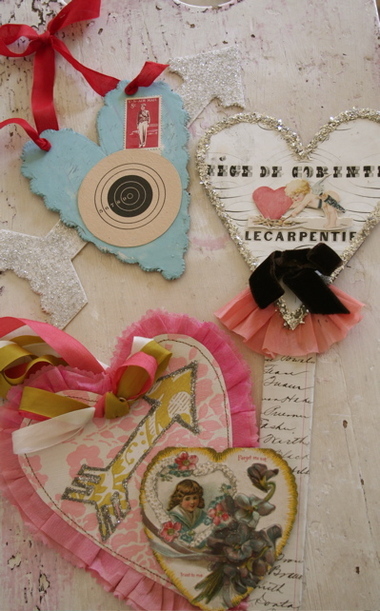 With that, some baker's twine, and a sewing machine, you've got everything needed to make these little hanging hearts. Simply sandwich the baker's twine between two of the hearts and zigzag stitch over the baker's twine to keep it in place. This way the hearts will hang straight, although tilted would be cute too. Because I wanted my hearts to hang in a straight line down, I was sure to catch the twine in the zigzag all the way down to the point of the heart, then without cutting the twine, sew the next heart on a few inches down. Of course, you can also cut your own hearts out of anything. I used some of the hearts as templates with paper I had already. Be sure to leave extra twine at the top of your strand so you can wrap it around something to hang. A journal page showing some Valentine's made this year inspired by Thomas Campbell. And the finished pillow from yesterday's post. I love Valentine's Day crafts! We've been having some fun around here making Valentines. It all started with Carol's party, each guest made some to hand out. These below were made for party people. And this one was made for me by my little guy. I had a dent in my art room wall, so I painted a heart and he took a pencil to it. LOVE that he made his "O" a heart shape. Never know when the "it's not cool to be all cute and lovey with my MOM" stage will kick in...hopefully never. This weekend I found some colored wax paper that I had bought years ago from Martha by mail. Oh how I wish Martha would sell her old crafting kits again. In a Valentine mood, I made some very simple tokens of love for my brood. You probably can't tell that all the colored paper is wax, but it makes it yummier in person; that crinkle is such a fun sound to me. 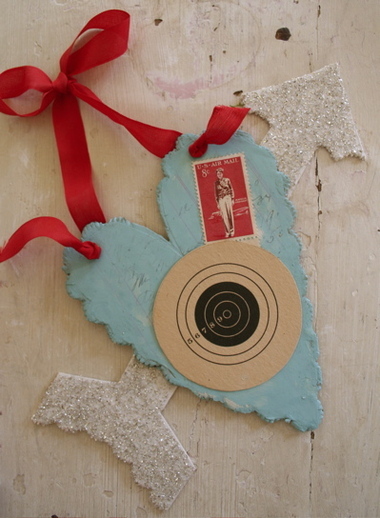 I really love crafting for Valentine's Day, and this year I am committed to allowing myself time to do just that. Maybe a shot of the back will make the see-through wax more obvious? How about you? Been bitten by the crafting-love bug yet? It's going around for sure! I'm excited about this pink month ahead. Can't wait to make some Valentine's of my own. Garland guidance: Ok, first of all, I must tell you that the reason I have put off giving you info is not that I'm not happy to share, it's that the thought of me figuring how to even make a "tutorial" (I should have never used that word, very intimidating to me, how about "helpful hints" instead?) makes me feel a bit like this lady from an old piece of sheet music; a little tired, confused and hesitant to stick her toe in the water. My mind just doesn't think in a logical, descriptive, organized "how to" manner. I just kinda make something and find it easier to just do it, like a chef without recipes or measurements, and it's hard for me to put in text on a blog. Demonstrating is easy for me, I can just blabber on about how my mind is thinking, but the technical details put in paper form? not so easy. Then you add the whole computer part. I know people are so good at adding info to their sidebars etc., but I'm not one of them. Each sidebar element, blog header and blog design, even the pdf for the embroidery, is all done by scanning my designs, emailing and then talking on the phone with my brother while he does all the computer work. Additionally, I realize that it wouldn't be fair for me to give all the nitty gritty away when some people are paying to take a class or participate in making garlands with me. However, I also realize that it is not possible for everyone to come to art class events. So I'm going to share some general guidelines to get our creative sisters that can't attend started, while assuring those that are coming to one of the garland classes/demos to fear not. I have lots more to show/teach/explain. You will not be paying for information that everyone else is getting for free. I understand and respect those concerns, as Im sure everyone does. 1.Take ready made paper circle items, like coffee filters or muffin cups like these super cute ones found at layercakeshop on etsy (I told you, I'm thinking Valentine's Day already). Incorporating papers such as tissue,crepe etc. 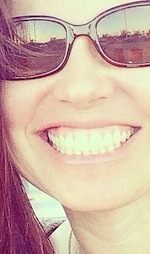 add texture and color and thickness as well as interest and color and will have different "scrunchibility". 2.Flaten your muffin cups and cut the additional papers to size of the ready made circles. Make piles of circles into any thickness that pleases you. Punch a small circle in the middle of each pile. Take a long piece of string/ribbon/yarn etc. and cut the length you want your garland to be plus additional foot. Tie a knot approximately 2' from the end of your string. Thread one pile of circles onto the string, stopping at the knot. Once on, tie a knot at the other end of the pile, thus keeping it in place. Tie a new knot a pleasing distance away from the last on either side of the previously threaded circles (approximately 6") and thread another pile of papers on, knot other side. Repeat this knot/thread/knot pattern until your string is full. Scrunch/puff various papers from each grouping of circles. Now, does that make sense? I hope so. I told you my mind doesn't really think like this naturally! Really, just play and have fun, there are no rules and there is no wrong way to do it. Do what looks pleasing to your eye and all then you'll be happy to hang it in your home. Hope you had a lovely day yesterday. I love Valentine's Day. 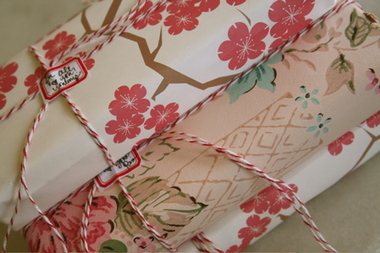 Love all the paper/crafty goodness of it. Love how simple it is and how much the kids love it. Every year I make some home-made valentines for my three Valentines. 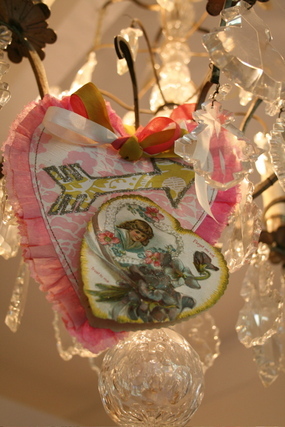 I love it when I find some old home-made valentine's at the flea market, and hope that mine will age in that same nostalgic way. Here are the ones from this year.